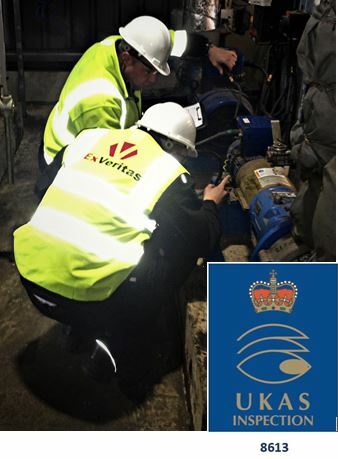 ExVeritas holds UKAS accreditation mechanical (non-electrical) equipment inspection against the requirements of ISO/IEC 17020:2012 as a Type A inspection body in the field of Ex Inspections, as identified in International, European and UK legislation. This accreditation ensures that Ex inspections undertaken by ExVeritas, as part of the Explosion Protection Document (EPD) requirements of ATEX “User” Directive (DSEAR in the UK), satisfies the stated competence requirements of the Directive. We issue fully UKAS accredited internationally recognised certificates for hazardous area Ex Non-Electrical Inspection and Ex Non-Electrical Repair Verification. UKAS is the national accreditation body responsible for determining the technical competence and integrity of organisations and their compliance as an Inspection Body to ISO17020. UKAS assesses and accredits the competence of inspection bodies to operate in specified fields and perform various types of inspections. This ensures that the required standards are maintained. For International Customers the UKAS Certication is internationally recognised (ILAC). ExVeritas are an ATEX Notified Body, IECEx Certification Body, CompEx Certification Provider and hold UKAS Accreditation to ISO/IEC 17025, ISO/IEC 17065, ISO/IEC 17021:2005 and ISO/IEC 17020:2012. UKAS ‘Type A’ accreditation provides evidence that the ‘Ex Inspection’ supplier has demonstrate their dedication to meeting the highest level of service, with the ability to deliver inspection & testing services, uninfluenced by commercial interests and/or operational influences. We are accredited to conduct and issue UKAS Certificates for Initial, Periodic Inspections of types Detailed, Close and Visual. We are also accredited to verify repairs to BS EN 60079-19 and to issue certificates as a ‘Certification Body’ for ATEX/IECEx rigs, skids and mobile/modular plant. ExVeritas consultants are verified experts in the field of Ex Inspection & Installation as required by the ATEX/DSEAR Directive for EPD Sign off. We have extensive Professional and Public Liability Insurance specifically for Explosive Atmosphere Consultancy and inspection and have an extensive and impressive track record of successfully completed projects world-wide. ExVeritas has more internationally recognised accreditation in the field of ‘Ex’ non-electrical inspection and certification than any other company worldwide. ISO 80079-37 Part 37: Non-electrical equipment for explosive atmospheres “ Non electrical type of protection constructional safety, control of ignition source, liquid immersion. In this example you can see that on a diesel generator (located in a hazardous area) the exhaust protection has failed, this was only discovered using thermal imaging which revealed ignition capable temperatures. ExVeritas use Zone 1/21 ATEX and IECEx Certified Non-Destructive Thickness Testers with a high accuracy +/- 0.05mm from 3mm up to 100mm even reading through painted surfaces. This technology is unsurpassed for preventative maintenance and checking plant and equipment against EN1127-1 and EN 13463 non-electrical protection concepts that rely on structural integrity. ExVeritas consultants are verified experts in the field of ATEX and IECEx mechanical certification and inspection. As we issue both ATEX and IECEx Certification for Mechanical Ex Equipment, we are true experts in the requirements for installing and maintaining such equipment, this level of skill is far beyond that gained on a training course, we are Notified and an IECEx CB in non-electrical equipment certification. We have Professional and Public Liability Insurance specifically for Explosive Atmosphere Consultancy and have an extensive and impressive track record of successfully completed projects. We offer the most complete and highly accredited EX inspection service available, all at a very competitive firm cost. We can estimate for free, normally within 48 hours..